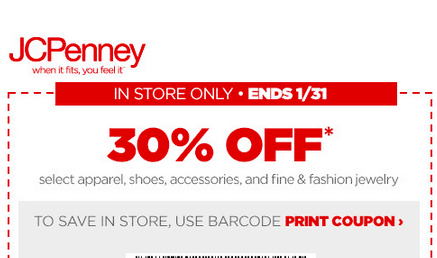 JCPenney Coupon - RARE 30% Savings - Grab it now! You are here: Home / Bargains / JCPenney Coupon – RARE 30% Savings – Grab it now! JCPenney Coupon – RARE 30% Savings – Grab it now! JCPenney has a new section on the top of their page called “Coupons & Savings”! Right now you can score a 30% off Coupon to use in stores or online! Grab it now while you can! Grab this JCPenney Coupon now while you can! Details: 30% off select original and regular–priced apparel, shoes, accessories, fine & fashion jewelry purchases. Offer good in store only, excluding taxes and shipping charges,1/20/15–1/31/15. Does not apply to SALE or CLEARANCE MERCHANDISE, BOGO’s, Best Value, Levi’s, Disney Shop, Assets Red Hot Label by Spanx, Licensed Team Sports Merchandise, Columbia, Nike, Clarks, Athletic Shoes, Jewelry Trunk Shows, Modern Bride Diamond Vault, Watches, Sephora, Home, Furniture, Mattresses, Custom Blinds & Shades, In–Home Custom Decorating, Personalized Jewelry, Services, Service Plans, Gift Cards, Closing Store Purchases, current orders and prior purchases, or in combination with other coupon(s). Can be combined with earned JCPenney Rewards. Coupon cannot be used for payment on account. Coupon cannot be redeemed as cash or merchandise credit if merchandise is returned. No cash value. Also saving 4% cashback while going through ShopAtHome.com on your shopping venture!